Hephesto's Forge: Back in business people! Pretty much my longest-running painting project ever, which is utterly driving me insane. At the same time though, I cannot deny that taking time and feedback from a ton of people does definitely make these minis quite nice thus far. Regardless, it is time to finish these off and get them sent off to my buddy Martin. 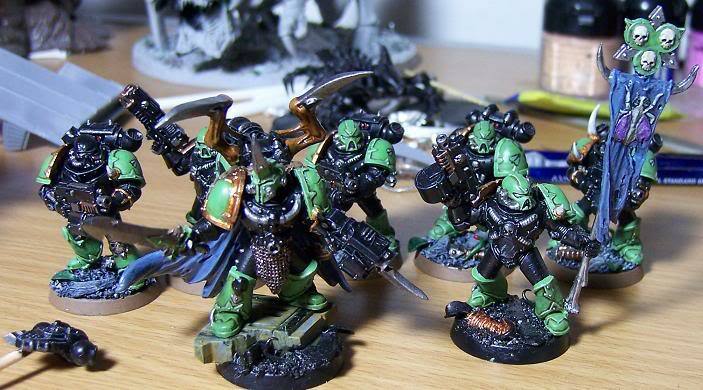 So this past weekend, in between the wonderful weather and some exquisite Belgian beers, was spent on adding a ton of detail to the Vespid squad. The armour, T'au chest symbol and armour cables are now done on all minis, while the weapons are well underway as well. So with some luck this batch will be done by the end of the weekend, on their way to the UK mid of next week and in Martin's happy hands by the next weekend. Now just to take care of those hundreds of little details that still need attention (weapon, weapon detailing, brass rings, toe talons, sensor spines, clean up & varnish coat)! 2 - eeeeew, it's Nurgle alright! By now these are about four years old, but definitely are still counted amongst my favorites. They're part of my old Chaos Space Marine force and were once planned to be the start of a full, individual Purge force. This got us reminiscing about all those old hobby plans we had that never came to fruition (long, long list constrained by time, motivation and ability), what can I say we're slowly, but surely get old. 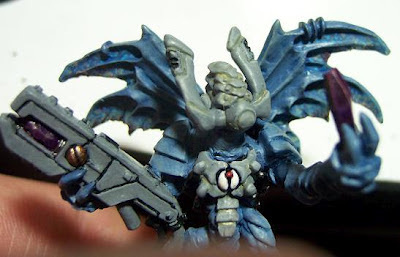 It may have been the beers or his actual arguments, but at the end of the day I've ended up with a plastic Nurgle Chaos Lord and a challenge to turn him into a Nurgle Chaos Space Marine sorceror. 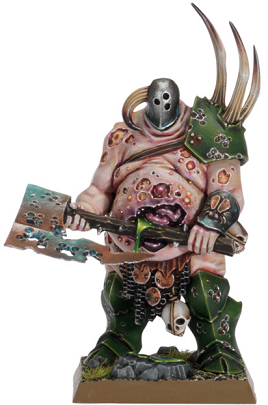 The feel of the Lord is just perfect for Nurgle in my opinion; big, lumbering and looking more like a force of (sick) nature, rather than a controling warp-manipulator. In the next 2-3 weeks this guy will be passing by a few things as I take things from concept to final mini, which will hopefully be an interesting journey for both me and the readers! 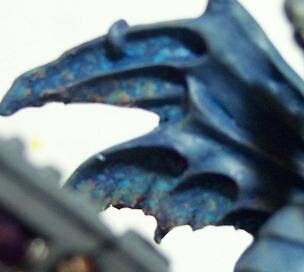 Quick new tidbit for the From the Warp-fans out there, the blogroll is slowly being rebuild by Ron. So if you want to be included in the new one don't forget to mail your blog-address to him. Check out all the information - here.